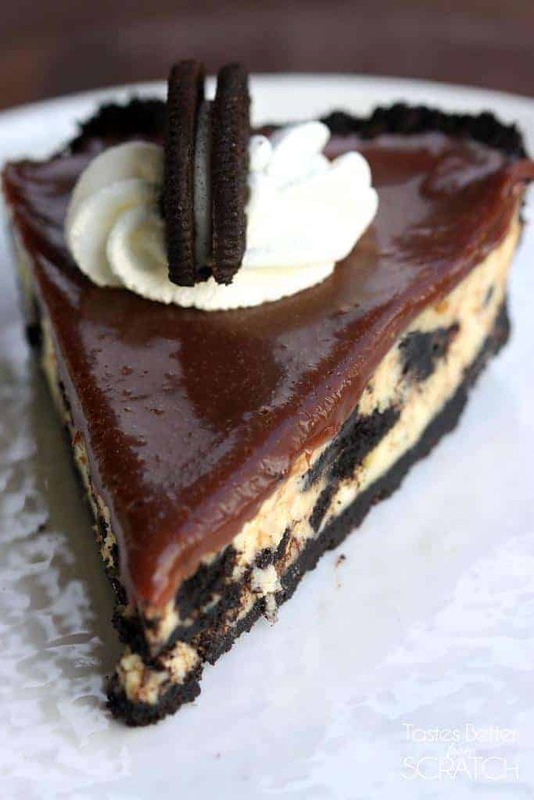 Oreo Cheesecake with an Oreo crust, cheesecake filling, and chocolate ganache topping. A simple recipe that anyone can make and everyone will enjoy! My husband was officially the happiest man in the world after trying this Oreo Cheesecake. He’s completely Oreo obsessed–he even prides himself on his “very special” method for dunking them: gently sticking the prongs of a fork into the creamy center before dunking them in milk. That way his fingers stay dry :-). He obviously feels deeply when it comes to Oreos! Second: It’s got the easiest Oreo cheesecake filling ever. This recipe is PERFECT for cheesecake beginners or veterans alike. You really can’t mess it up. And you don’t even need to worry about the top cracking because it gets covered by a delicious chocolate ganache. Lastly: This Oreo Cheesecake is made in a pie dish, not a spring-form pan, like traditional cheesecakes. That means it’s easier than ever! So there you go. 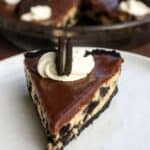 Three steps to the most heavenly Oreo Cheesecake Pie of your life! 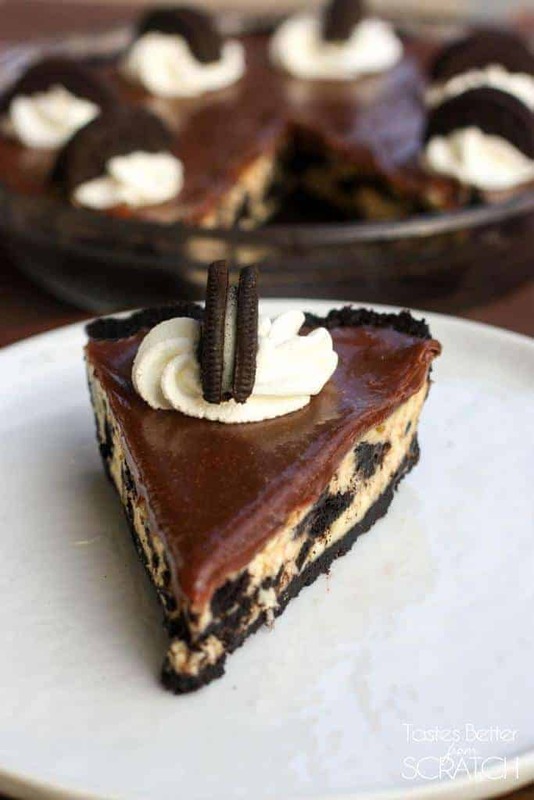 Oreo crust, Oreo cheesecake filling, and chocolate ganache on top. AMAZING. 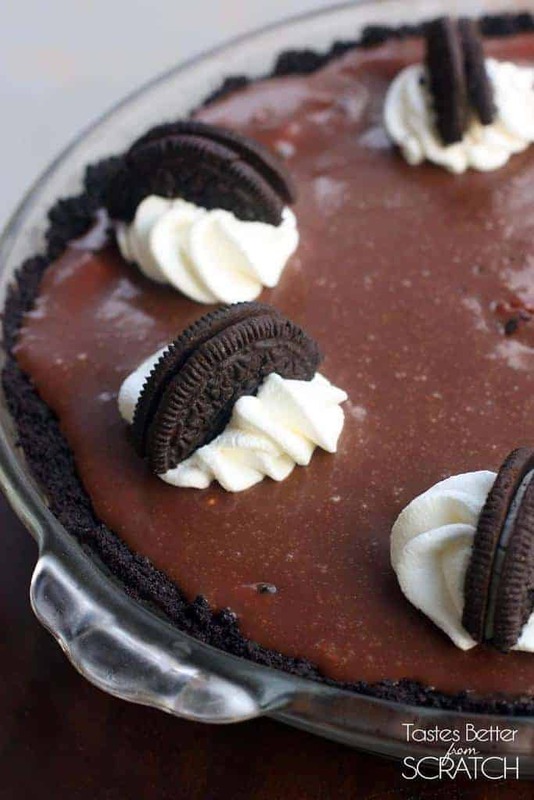 Oreo cheesecake pie with an Oreo crust, cheesecake filling, and chocolate ganache topping. A simple recipe that anyone can make and everyone will enjoy! Place Oreo cookies in a food processor and pulse until small crumbs. Stir in the melted butter. Press the mixture into a deep dish 9-inch pie plate, covering the bottom and up the sides of the dish. Refrigerate while you make the cheesecake filling. Add softened cream cheese to a large bowl beat with your stand mixer or electric mixers until fluffy. Add eggs, 1 at a time, beating after each addition. Add vanilla and sugar and mix well, scraping down the sides of the bowl. Fold in the Oreo chunks. Pour batter into Oreo pie shell and bake for 35-45 minutes or until the edges are set and the center is slightly firm (it can be a little soft, just not jiggly). Once the pie is cool, make the ganache. Combine the butter and cream in a saucepan over medium heat until the butter is melted and the mixture is simmering. Place the chocolate in a small bowl. Pour the hot cream mixture over the chocolate and stir until melted and smooth. Add the vanilla and powdered sugar and stir well. Pour the ganache over the cheesecake, carefully smoothing to cover the top evenly. Refrigerate until ready to serve (at least an hour - the pie can be made up to a day in advance). I just entered this pie in my church pie competition. It was the runner-up. I lost to a generational family fruit pie. Everyone loved this pie! The most common comment was that the crust was perfect. I will definitely make this again! How FUN! Thanks so much for sharing Joelle! I have now made this three times and it has become a favorite for birthdays and anytime we want a yummy dessert. It’s actually easy to make and tastes amazing! I do prefer buying premade Oreo pie crust though.